The very first Stampede Parade brought in a crowd of 75,000 people, which was more than Calgary’s total population of 60,000 residents. Today, the Western celebration is a customary tradition for Calgarians and attracts over 400,000 people from the city and beyond. Calgary Exhibition and Stampede parade, 1912. Photo Courtesy of Glenbow Museum. Every year, bleary eyed Calgarians make the annual trek downtown at the crack of dawn to get a coveted curbside seat for the Stampede Parade. Cowboy hats dot the sea of people along the parade route where city locals and tourists from across the globe eagerly wait for the first drum from the Calgary Stampede Showband, signaling the start of Calgary’s famous pageant. Since the first Stampede Parade in 1912, crowds of people from Calgary and beyond have been awed by the world famous spectacle. Organized by the founder of the Stampede, Guy Weadick, the first Stampede Parade was a massive success that attracted tens of thousands of people. 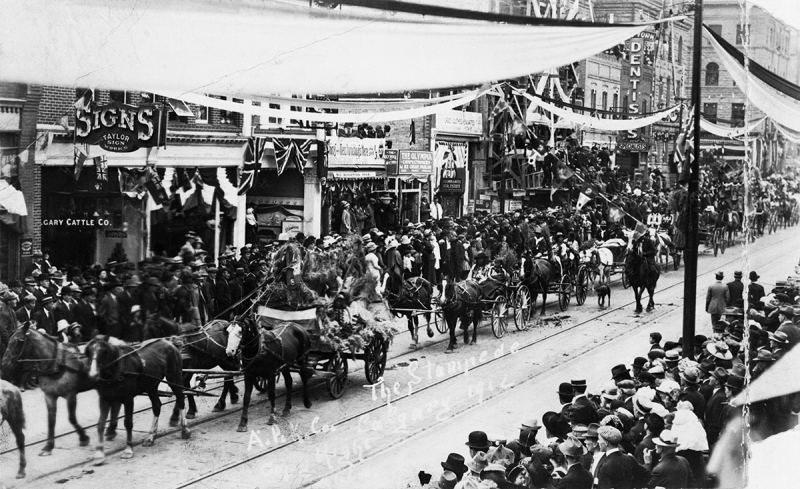 Although Calgary’s population at the time was just about 60,000, the 1912 Stampede Parade saw a crowd of 75,000 people coming to witness what Weadick advertised as the “Grandest Pageant of All History”. 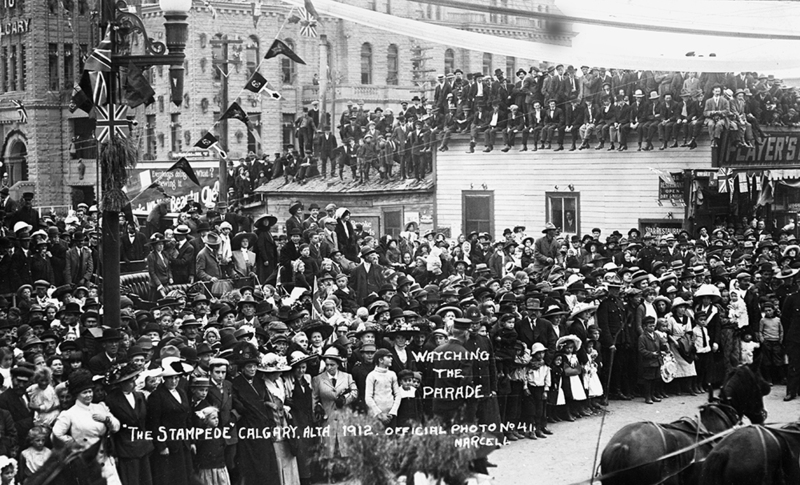 Crowd watching Calgary Exhibition and Stampede Parade near city hall, 1912. Romanced by the allure of the wild, wild West, Weadick organized the first Parade as a chronological display of the history of the Frontier and showcased all the elements he saw as crucial to a celebration of the West. The event was lead by almost 2,000 Indigenous people, dressed in full regalia, from the five tribes and nations of Treaty 7 – the Blood Tribe, Piikani Nation, Siksika Nation, Stoney Tribe and the Sarcee (now named the Tsuut’ina Nation). 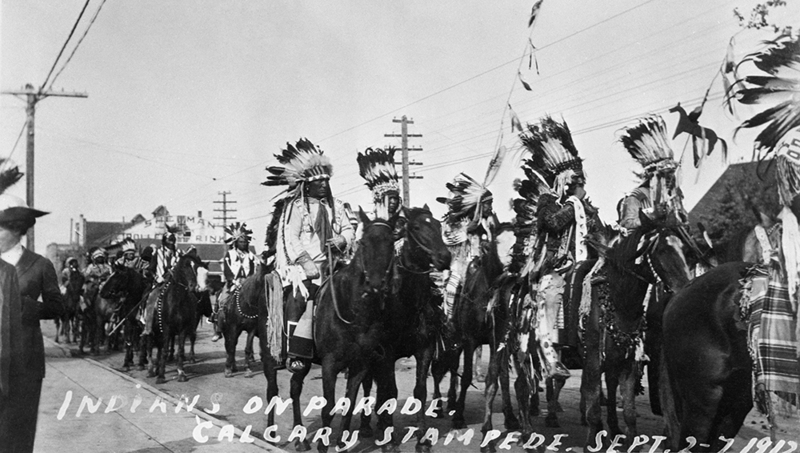 First Nations individuals in Calgary Exhibition and Stampede parade, 1912. Following behind southern Alberta’s Indigenous peoples, the rest of the Parade showcased missionaries and Hudson’s bay traders, North-West Mounted Police veterans (known as the “old Mounties”), cowboys and cattlemen, stagecoaches and settlers, and the young “citizens of the future”. Today, more than 100 years later, the Calgary Stampede Parade is a world famous event. This grand display of Calgary heritage and spirit attracts nearly 400,000 people to the city’s downtown streets every year. Beyond the city limits, live TV broadcasts of the show roped in 2 million people nationwide, and it is considered the second largest parade in North America, after the Rose Bowl Parade in Pasadena, CA. And for Cowtown residents, the Parade today is an enduring Stampede tradition that, for many people, has spanned generations. Born and raised in Calgary, 60-year-old Gilkes attended her first Stampede Parade in 1958 at only five months old and has returned for the show almost every year since. In total, she has been curbside for 57 parades. Along with thousands of other Calgarians, Gilkes and her family rise with the sun on parade day every year and make their way down for the show. Many locals even have a favourite spot along the route they return to year after year – for Gilkes, it was a station near a Tim Horton’s on 6th Avenue until recent years when her and her family began scoping out a seat in front of the Calgary Tower on Centre Street. Although much has changed since Weadick’s first Stampede Parade, the parade we know and love today still aims to celebrate the Western spirit of the Stampede and is a tradition many Calgarians look forward to every year.